There are many economic pitfalls lurking round the world. Any one of them could bring a nasty surprise. Let’s look at ways to diversify so the next downturn doesn’t catch us. The June 6, 2011 message entitled “Are we 30 days from Economic disaster” looked, with some concern, at the negative global economic consequences a downgrading of US sovereign debt could bring if Congress did not increase the debt ceiling. Many feel that US debt has grown so high that it cannot be repaid. 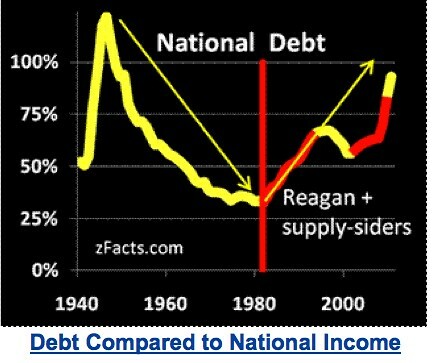 The chart below from zFacts.com shows that US debt as a percent of national income has been higher in the past. 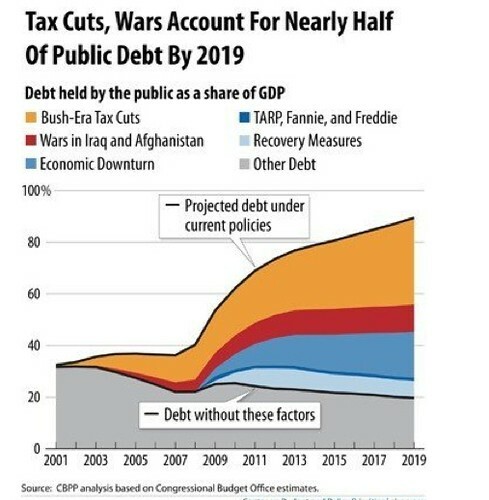 Another graph shows that if taxes were raised… the wars in Afghanistan and Iraq stopped, that the debt could be dramatically cut. Long term debt problem is solvable if a deeper concern is shown beyond the immediate debt. Even if Congress gets its act in gear (history suggests that this is likely) and a US debt downgrade does not come now… there are some other pitfalls worthy of a global economic stumble. One of these economic pitfalls is a collapse of an institution that is guaranteed by the US government that could trigger a crisis and bring too much of America’s unfunded debt out of the future into the here and now. Excerpts from a June 6, 2011 USA Today article entitled “U.S. funding for future promises lags by trillions” by Dennis Cauchon shows the problem: Federal government’s financial condition deteriorated rapidly last year, far beyond the $1.5 trillion in new debt taken on to finance the budget deficit, a USA TODAY analysis shows. The $61.6 trillion in unfunded obligations amounts to $527,000 per household. “The (federal) debt only tells us what the government owes to the public. It doesn’t take into account what’s owed to seniors, veterans and retired employees,” says accountant Sheila Weinberg, founder of the Institute for Truth in Accounting, a Chicago-based group that advocates better financial reporting. To help readers diversify out of the dollar, I have started a series of “Cash in Crash “reports available through Amazon.com’s Kindle store entitled “Cash in Crash”. The first report in this series is Cash in Crash – Brazil. Here is an excerpt from that report. It looks as if another economic crash is coming… one that could cause some of the greatest economic shifts we have known, three times bigger than anything since WWII. These shifts can make some rich beyond belief… others much poorer. There are seven ways to profit and cash in during this crash. This report focuses on Cash in Crash Opportunity #1 and reviews how and why small investors can easily make multi currency investments in Brazil without going to or opening accounts in Brazil. The real (the plural is reais) is the currency of Brazil. Its sign is R$ and its ISO code is BRL. It is subdivided into 100 centavos (“hundredths”). In Portuguese (Brazil’s official language (Portuguese) the word real means both “royal” and “real”. The real became the official currency of Brazil 1994 as part of monetary reform to end a history of heavy inflation. Initially the real was worth 1 real per 1 US dollar and eroded in parity over the next five years dropping as low as 4 reais per 1 US dollar. In 2002 the real began to recover and the parity as of May 20, 2011 was 1.61 reais buys 1 US dollar or a real is worth about 61 cents US. Our publications have been reporting (and I personally have been using this strategy for over 40 years) on multi currency investing… clear back into the 1970s long before this became a fashionable idea. The strategy is really simple. Most currencies rise and fall in their parity versus other currencies. As they rise, their interest rate tends to fall. When weak their interest rate, tends to rise. Markets rarely judge and value the interest rate relationships correctly. They tend to overvalue strong currencies and undervalue weak ones. The goal in multi currency investing is to sell low interest paying, strong currencies (that should not be so strong) and invest in high interest, weak currencies (that should not be so weak). The first profit in this process is the higher interest earned. Also eventually currency fundamentals such as government deficits and debt, interest rates, trade balances and current acocunts overrule market sentiment; and the weak currency strengthens versus the strong as well so there is a forex profit to boot. Take for example the US dollar versus the Brazilian real. This chart from www.economist.com (see http://www.economist.com/node/18713776?story_id=18713776) shows that the US trade balance is -3.6% of America’s Gross Domestic Product. This means more money is flowing out of the US than is coming in. When this happens, dollars must be converted to other currencies which then pushes the greenback down versus the currencies of the countries where the money goes. The US also has a huge negative budget balance… -9.1%. Deficits, if financed by loans, create money that is not backed by production. This causes inflation which weakens a currency, versus currencies in countries with lower inflation. Finally, the US dollar has a really low interest short term interest rate 0.13% and low 10 year bond rate 3.13%. The interest rate of a currency is what usually attracts investors. If fundamentals of a currency (like the dollar’s current account and deficit above) are lousy… the interest rate usually rises. On the other hand, we can see that the fundamentals in Brazil are much better. The current account deficit is much lower (-2.8& of GDP versus the US -3.6% and the deficit is only -2.3% versus the US -9.1%. However the interest rates available for the Brazilian real at 6.16% (vs 0.13%) and 11.92% versus (3.13%) stomps the buck’s return. In short the Brazilian real is fundamentally a much stronger currency than the US dollar. The market has made a living proof of this fact. You can order the entire report “Cash in Crash – Brazil” for your computer or your Kindle from Amazon.com by clicking here. Cash in Crash – Brazil at Amazon.com if you live in the US. Those living in other countries may need a different link. Amazon.com provides specific URLs for 3 stores (US, UK, DE) and the rest locate from the closest store to them or in the US store. If none of these links work… go to Amazon.com and in the Kindle store type in “Gary and Merri Scott”. Let’s keep looking at ways to avoid all of these economic pitfalls.